Note type of material used for chimney such as brick, block, metal and type of flue if visible such as clay lined or flexible metal. 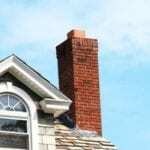 When inspecting the chimney, note missing or broken bricks or stones, missing or damaged chimney caps and flashing, proper damper operation and any signs of moisture damage. If clean out door is accessible, check for soot, debris, nests or signs of wild animal penetration. Use Thermal Imager as necessary to detect moisture issues. Skylights are inspected as any other roof penetration. Additionally the glass and any thermal seals are inspected. There are many items that are attached to the roof or that run through the roof including chimneys, furnace vents, plumbing vents, antennas, satellite dishes, etc. Any time an item penetrates the roof it creates an area for moisture to enter the structure. Any penetrations are inspected to make sure that flashing is present where it is required, that it has been installed and sealed properly and is in good condition. 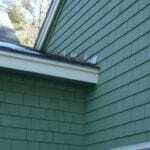 The drip edge is a layer of flashing located under the first row of shingles and it is specifically designed to support the edge of the shingles and prevent wood rot and damage to the fascia. 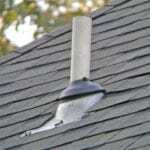 Check for installation of aluminum drip edge or wood shake starter course. 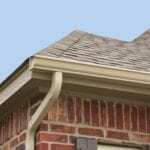 The roof drainage system consists of the gutters, downspouts, and diverters. These components catch the water as it flows from the rooftop and direct it down and away from the house preventing damage to the grounds and foundation. During the inspection we visually inspect these components to make sure they are properly installed and secured to the structure and free of debris that may obstruct the flow of the runoff. 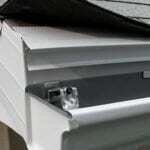 Improperly pitched or clogged gutters can allow snowmelt to freeze in the gutters and extend up the roof. These “Ice Dams” work their way under the shingles and allow moisture to penetrate the structure. Flashing is used to prevent water and moisture from penetrating joints. Joints are generally found wherever two surfaces meet. Common areas where flashing is found are where the roof meets the sidewall of a dormer, at the point where the roof meets the brick or stone of a chimney or in the valley where different sections of roof meet. When inspecting the flashing we start with the exterior and make sure that there is flashing present in the required areas and that it has been done properly and is in good condition. If flashing is not present in the required areas, is improperly done or damaged, moisture can enter the structure causing mold and structure damage over time. 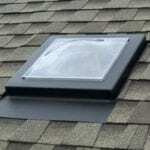 Flashing is also inspected from the interior, especially if the attic area if visible. Interior walls of concern are inspected for moisture penetration using visual observation, a moisture meter and thermal imager. The most common roofing materials we see are asphalt shingles, roll roofing (asphalt), and rubber. When inspecting these materials for we look for signs of wear on the surface of the material such as curled corners and the lack of granulated material on the outer surface. 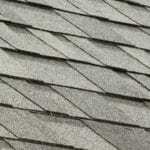 We also inspect for damage in the form of missing shingles, rips or tears and bumps or bubbling.